Nine Charlie Miller hair stylists were up for the challenge of this year’s Moonwalk. 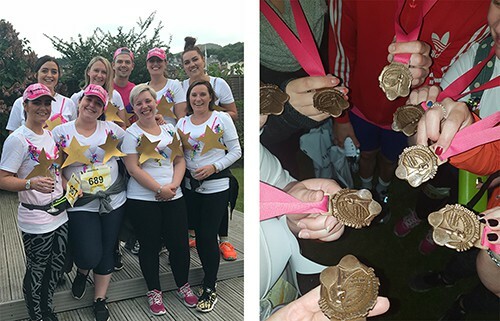 Not only taming their client’s manes by day but transforming into Hollywood Glam Queens and Kings by night they tackled the marathon-long charity walk with glitz and glam finding inspiration in old Hollywood glamour. The annual event, now in it’s 13th year, is in aid of uniting against breast cancer with events taking place around the world in places such as Peru, Disneyland Paris and as remote as the Arctic Circle. In preparation for their Half Moon walk these nine hairdressers set up donation boxes around all five Charlie Miller salons and have raised over £3K. Working with charities is something that comes natural to them and the company has a history of supporting families and individuals affected by cancer. Knowing how much hair can impact people’s lives our hair stylists found the cause particularly close to their hearts. Jason Miller, Joint Managing Director, has experience in dealing with clients who have undergone chemotherapy and hair loss: “A lot of people can find hair loss devastating especially while undergoing chemotherapy. Hair is such a vital part of our everyday lives and routines and is often underestimated. A well cut wig helps give normality at a difficult time.” Working closely with the Teenage Cancer Trust, Charlie Miller stylists have been providing support to young people affected by cancer for over ten years. If you would like to find out more about about Hair4u with the Teenage Cancer Trust and Charlie Miller simply visit the website. If you would like to book an appointment with any of our fabulous stylists simply book online, call us or pop into one of our salons. To keep up to date with news, offers and competitions follow us on Facebook, Twitter and Instagram.